Financial and other disincentives make it 'a lot to ask,' but recent progress that includes more funding for medication-assisted treatment offers signs of hope. Doctors’ groups have spent several months trying to coax fellow physicians to become Suboxone providers – apparently to little effect. Boosting the low supply of doctors who prescribe Suboxone is a crucial piece of the puzzle that if solved would help to meet the treatment demand for the thousands of Mainers in the throes of an opioid addiction. Those efforts haven’t worked yet. Among the barriers are cultural stigmas to treating patients with addictions, financial disincentives, bureaucratic red tape and doctors believing that opening their doors for drug treatment would overwhelm their practices. Also, most primary care doctors did not receive much training in addiction medicine in medical school, so they are reluctant to take on new tasks that they are unfamiliar with, experts say. “We needed a waterfall, but so far we’ve only had a trickle,” said Dr. Elisabeth Fowlie Mock of Holden, one of the physicians leading the effort to expand treatment. “The uptake has been super slow,” said Dr. Lisa Letourneau, executive director of Maine Quality Counts, a nonprofit that deals with health care policy. However, there are encouraging signs that some doctors are beginning to crack the code that would expand access to drug treatment by more efficient use of the existing health care system. And there’s a flurry of recent activity aimed at expanding treatment – including several bills expected to go before the Legislature this session, a recent announcement to fund more medication-assisted treatment – or MAT – by the Maine Department of Health and Human Services, and a health nonprofit funding several treatment programs. Lack of access is one of the most consistent problems for those grappling with solutions to the opioid crisis, especially in Maine, where little treatment is available. An estimated 25,000 to 30,000 Mainers desire drug treatment but believe they don’t have access to it, according to a survey by the U.S. Substance Abuse and Mental Health Services Administration. The opioid crisis has swept the nation, and drug overdose deaths now surpass fatalities from car accidents annually. In Maine, about one person died of a drug overdose per day in 2016, with 286 deaths through Sept. 30, the latest figures available. Gordon Smith, executive vice president of the Maine Medical Association, which represents doctors before the Legislature, said there are some good signs of progress, but at the same time the response by the state and health care system has been slow considering the urgency of the crisis. “Where is the sense of outrage? We are losing hundreds of people to opioids. It’s infuriating,” said Smith, who crisscrossed the state, giving dozens of talks to doctors about becoming Suboxone providers. “We’ve stuck our heads in the sand for too long. We can’t ignore this any longer,” said Dr. Ann Skelton of Maine Medical Partners in Portland. Skelton, a primary care doctor, became a Suboxone provider in 2014. Suboxone is a medication that helps curb cravings for opioids in the brain. Suboxone is similar to methadone, but methadone is typically for more severely addicted patients, and methadone clinics usually do not allow the medicine to be taken home. In order to prescribe Suboxone, doctors must take classes by the U.S. Drug Enforcement Administration. While hard numbers are difficult to come by, Maine Quality Counts estimates that only 5 percent more doctors have become regular Suboxone prescribers since work to persuade them to join the ranks started last summer. Factoring in a modest increase, there are about 215 to 230 regular Suboxone providers in Maine, according to the group. In comparison, there are about 2,000 primary care physicians in Maine. But still, there are some heartening signs, doctors say. MaineHealth, the network which includes Maine Medical Center and a number of other hospitals, will be training more than 30 doctors to become Suboxone providers at the end of this month, and has significantly expanded its numbers over the past year, officials said. There are about 60 Suboxone providers in the MaineHealth network currently, but officials didn’t know by how much it increased compared to a year ago. Also helping to increase Suboxone prescribing is a federal rule that went into effect in 2016 that increased the maximum number of Suboxone patients one doctor can treat from 200 to 275. And starting this spring, nurse practitioners and physician assistants will be able to take training courses that will allow them to prescribe Suboxone, which will help meet demand, Smith said. Besides cultural bias, there are many institutional barriers preventing more doctors from becoming Suboxone providers – red tape, reimbursement problems and financial issues, doctors say. With many opioid users without insurance, there’s no workable financial model to treat them or pay for their medication. “Our biggest hurdle is the uninsured,” said Dr. Kristen Silvia, an addiction specialist with Maine Medical Partners primary care. Silvia, who travels with a four-person team to primary care practices in Scarborough, Falmouth and Westbrook, said there’s currently no way the system can pay for the medication for an uninsured patient. Suboxone costs about $5,000 per year, but prescribing the medication is only part of the treatment, as those on the drug need behavioral health counseling and other supportive services. The patients present complex problems, which is another barrier. O’Connor said there’s a fear among primary care doctors that becoming Suboxone providers will lead to an overwhelming number of those suffering from substance use disorders showing up at their practice. The patients who are treated have complex problems that can’t be hashed out in a typical 15-minute doctor-patient talk. “If they show up and they’re homeless and have child custody issues, that’s an hourlong visit,” O’Connor said. Also, doctors sometimes have to treat patients in the throes of difficult and painful withdrawal symptoms. “Withdrawing from opioids won’t kill you, but you will feel like you want to die,” O’Connor said. 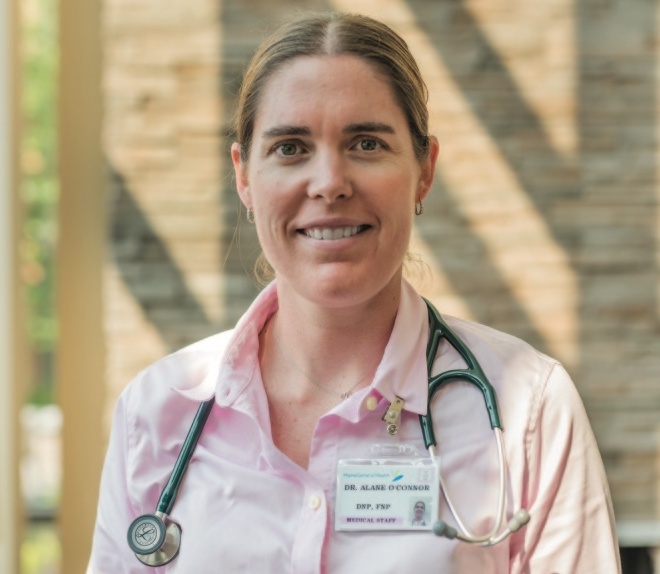 O’Connor said considering the scope of the problem in Maine, she can see why there’s resistance by doctors who worry that they can’t handle the demand. O’Connor said when she saw efforts to persuade doctors to prescribe Suboxone failing to gain traction, she started thinking of a different approach. O’Connor, who is part of the MaineGeneral Medical Center network, said several months ago she was brainstorming with hospital doctors, who were frustrated with the number of overdose victims showing up in emergency rooms. The patients were receiving no substantial help after they were released because there wasn’t a treatment network to take them in. The patients would often be released from the hospital, end up using again, overdosing and wind up back in the emergency room. O’Connor said she thought that instead of asking already-stretched doctors to do more, a better approach to solving the problem would be to ask everyone to pitch in a little. Instead of asking for doctors to completely change their primary care practices, O’Connor said she would try to make it as easy as possible to help out. She likened it to taking a turn at the concession stand in a youth sports league. O’Connor said the program – called Outpatient Plus – is expected to start in April. Once patients become stabilized, they will be transferred to primary care practices. It’s a similar idea for MaineHealth – which is trying to get doctors to buy into the program but not ask them to take on the most acute patients. “Integrating into primary care practices is the fundamental tenet of what we are doing,” said Katie Harris, senior vice president at MaineHealth. 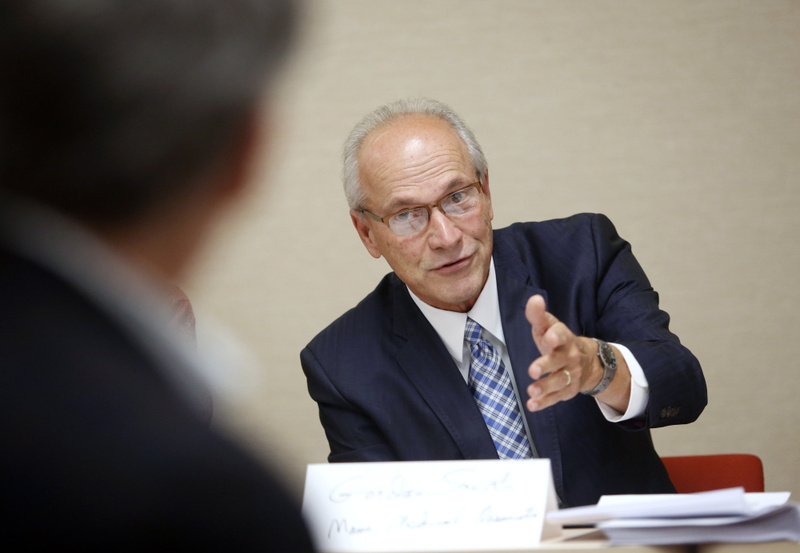 Harris said the idea is that teams of MaineHealth doctors, behavioral health workers and social workers would work with patients initially, and then once they are doing better, they would be handed off to primary care doctors. That way, many more patients can be treated. Since the MaineHealth team approach – called the Integrated Medication-Assisted Therapy Program – began last year, there’s been a 43 percent increase in patients being treated with Suboxone at primary care practices in Portland, Scarborough and Westbrook, Silvia said. 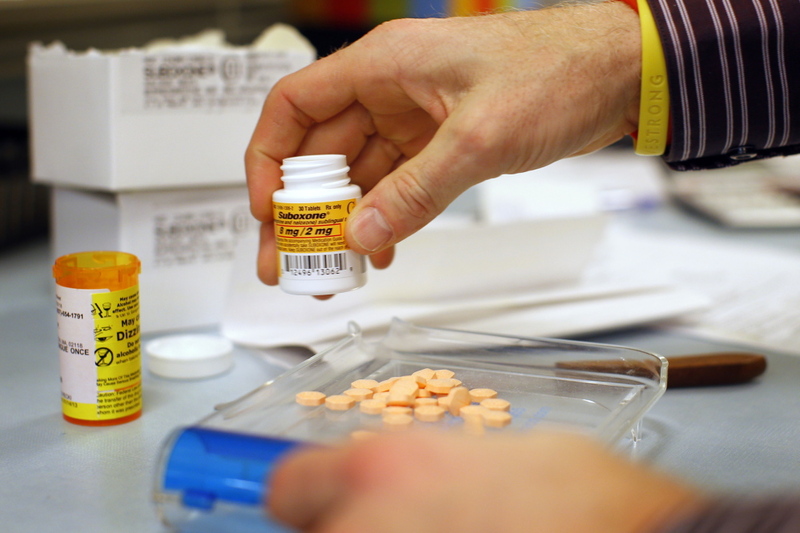 But more needs to be done, Harris said, and MaineHealth is lobbying for a bill that would expand medication-assisted treatment in Maine by addressing uninsured patients. She said she has two Republican sponsors, Rep. Karen Vachon of Scarborough and Sen. David Woodsome of North Waterboro. Harris said the dollar amount hasn’t been determined, but the idea is that a pool of money would be set aside for the state to pay for Suboxone treatment for the uninsured. The money would be on top of $2.4 million that Maine DHHS announced would go for medication-assisted treatment. Also, the Maine Health Access Foundation is granting $800,000 to nonprofits to expand MAT programs in Maine. And the Maine Medical Association is behind two bills requesting $1.9 million from the state that would establish MAT pilot programs in Washington and Piscataquis counties.